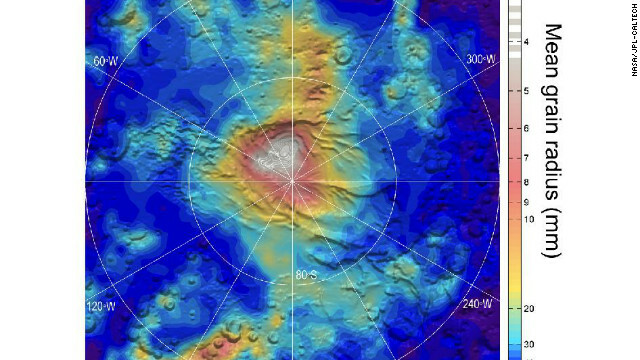 This is a map of Mars' south pole ice cap, showing of small-grain carbon-dioxide ice deposits are distributed. They appear to have come from snowfall. It's not time to get out the sleds and shovels in the United States, but all the way over on Mars, snow may be falling on the south pole. There appears to be snow falling on the Red Planet that is not made of water, however. This is frozen carbon dioxide, which can only exist at extremely low temperatures - namely, about -193 degrees Fahrenheit. New data to be published in the Journal of Geophysical Research explores evidence for carbon dioxide snowfalls that come from clouds around the Martian south pole during the winter. The data comes from the Mars Reconnaissance Orbiter. This is the only example of carbon-dioxide snow falling that we know about in the solar system, NASA said Tuesday. We know about water-ice snow on Mars too from NASA's Phoenix Lander, which observed it in 2008. "This is frozen carbon dioxide, which can only exist at extremely low temperatures – namely, about -193 degrees Fahrenheit." All this science "knowledge" will not bring the forgiveness and grace of the Lord God. CO2 rain will be replaced by a rain of hellfire upon the sinners who feel lust in their perverted space cosmos. Romney will cut this misguided funding, and the rover will be turned into rosaries, my brothers. Didn't Obozo cut NASA funding to begin with? I think you have your politicians mixed up! What does Romney have to do with Rein's diluted remarks? Please do not ever offer your opiions again, The world will be a better place. Mars composition is desert and dry ice, Hell frozen over. The freezing point of CO2 is -109 F, not -193 F. Look it up on google. The freezing and boiling points of any chemical is dependent on the pressure that it is under. Since the atmospheric pressure on Mars is so much lower than Earth's, CO2 will freeze at a lower temperature on Mars than on Earth. This is old news. We've known that Mars's south pole is covered with frozen carbon dioxide for a very long time now. We've seen the ice cap get bigger and smaller with the seasons, so we knew that it must "snow" frozen CO2 during the southern hemisphere's winter. This pretty picture is merely the first time we've gotten good, specific weather data – including the size of the ice grains – while it was happening. Simple.Mars has a Co2 atmosphere.In cold areas some of it will change to ice. Ice is made of water...now it we could convert CO2 to water that would be a trick. We can't do that.If you split it you would get carbon and oxygen.You would need hydrogen for it to be turned into water.